Here in the Stan Lee region, Rick Remender had a strong showing against Jeff Lemire… but now he must face Grant Morrison, who beat his DC Comics colleague Geoff Johns with relative ease! Meanwhile, two of comics’ most creative minds face off as Jason Aaron must deal with Jonathan Hickman! All you have to do is pick which writers you want to win in each contest. The first round of voting will go from March 20-24, with the second round kicking off on March 25. Remender is an American comic book and television writer best known for his work on Image Comics such as Deadly Class, Fear Agent, Black Science as well as Marvel Comics' Uncanny X-Force. While recently his Deadly Class book has been adapted to television and is currently in the middle of its first season. Like many of the other writers on our list, Remender found success writing for Marvel but many now know his name from a stable of independently owned Image titles that continue to wow readers with the scope of what his is able to think up next. High school assassins (Deadly Class), tech addicted puppets (Tokyo Ghost), new-age underwater scientists (Low), and dimension-hopping astronauts (Black Science) are just a few of Remender’s creations over the past five years or so. A modern master of world building, Remender has just begun to make his mark on the comics industry and many of his fans are looking forward to what fantastical worlds he’ll come up with next. Hickman is an American comic book writer and artist. He is known for creating the Image Comics series The Nightly News, The Manhattan Projects and East of West, as well as working on Marvel Comics' Fantastic Four, FF, and S.H.I.E.L.D. titles. In 2012, Hickman ended his run on the Fantastic Four titles to write The Avengers and The New Avengers, as part the "Marvel NOW!" relaunch. All leading to the groundbreaking six-part miniseries, Infinity, before masterminding the crossover event to end all crossover events in Secret Wars. While it can be tough to narrow down which Hickman book is your favorite, his attention to world building is unmatched. Just explaining the premise for East of West can take well over 10 minutes and Secret Wars was so inspired the Marvel Universe had to come to a halt for a YEAR just to tell the story. Books like The Nightly News and Black Monday Murders show just how deep Hickman is willing to go and his Fantastic Four runs show just how much attention he puts into not just the story but the characters themselves. 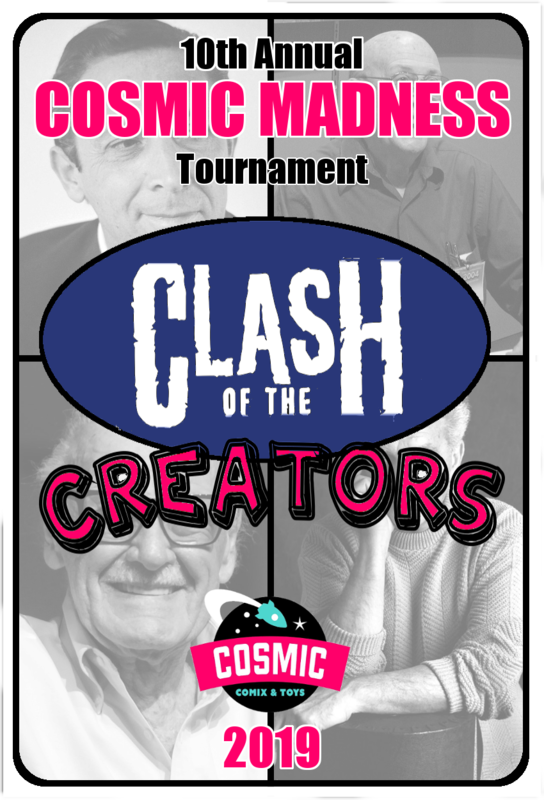 Check out the results for the Stan Lee Region so far!